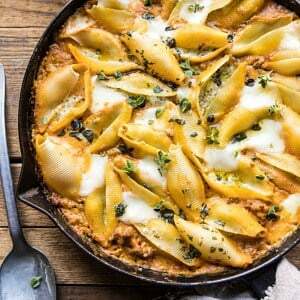 Spicy Pumpkin and Pesto Cheese Stuffed Shells. 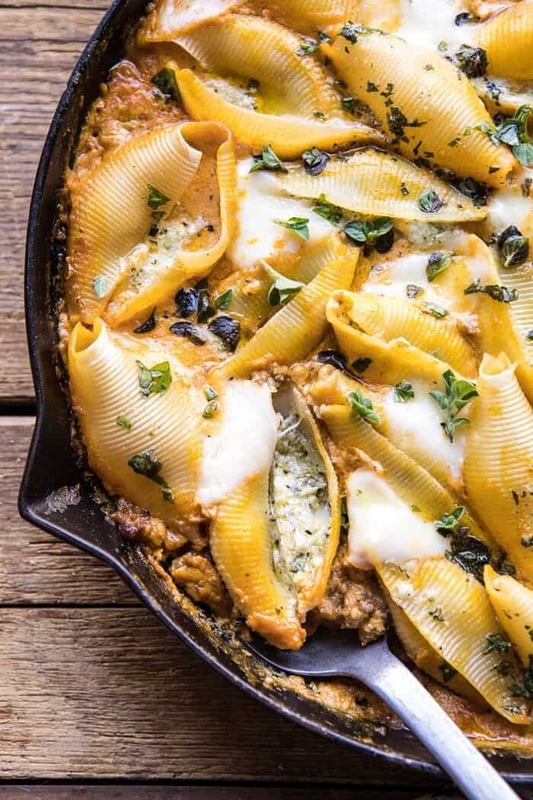 This Pumpkin and Pesto Cheese Stuffed Shells is for nights when you’re craving Italian, but you’re also craving fall flavors. 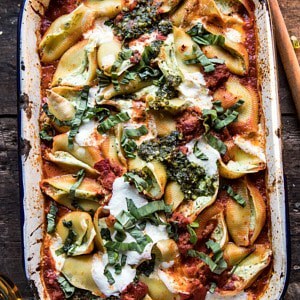 Jumbo pasta shells stuffed with a basil pesto and ricotta cheese mixture. Then baked in a spicy pumpkin vodka sauce that’s creamy and so delicious! 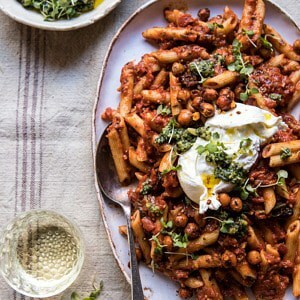 This is a great fall pasta to serve any night of the week, or for your next Saturday night dinner party. Can you guys tell that I’ve entered full on comfort food mode over here? I know it’s only October and all, but with our major snowfall this week (if you follow on Instagram you saw all the photos) I really cannot stop these comfort food cravings. When it’s cold all I want to make is butternut squash pasta, homemade curries, noodle soup, and homemade pumpkin butter. So, all the best fall food. I have to say, even though I think it’s WAY too early for snow, I’m loving the coziness it brings. As well as the excuse to stay warm inside all day. I swear the chill in the air, and the snow on the ground, makes cooking even more enjoyable for me. Which is nice considering that I’ve been spending almost all my time in the kitchen lately. Anyway, moving on to this pasta. I was inspired to create these pumpkin stuffed shells after making this pasta last year and loving it so. This is kind of the fall version of that pasta dish, and as you can guess, it’s a new go-to for me. This easy recipe uses a lot of pantry staple ingredients. And while it does take some time, it’s still very easy to make and comes together in just about an hour. To start, make the spicy pumpkin vodka sauce. This is just a mix of spicy ground chicken sausage, pumpkin puree, vodka, and spices. I love using chicken sausage as it adds so much flavor. It also means you don’t have to add extra ingredients like onions and garlic to the sauce. One note, I prefer using lean chicken over pork sausage, which can be a little too greasy sometimes. While the sauce simmers, make the stuffed shells. These are the almost too good…fresh ricotta, fontina cheese, and basil pesto, all stuffed into a pasta shell? Nothing not to love here. 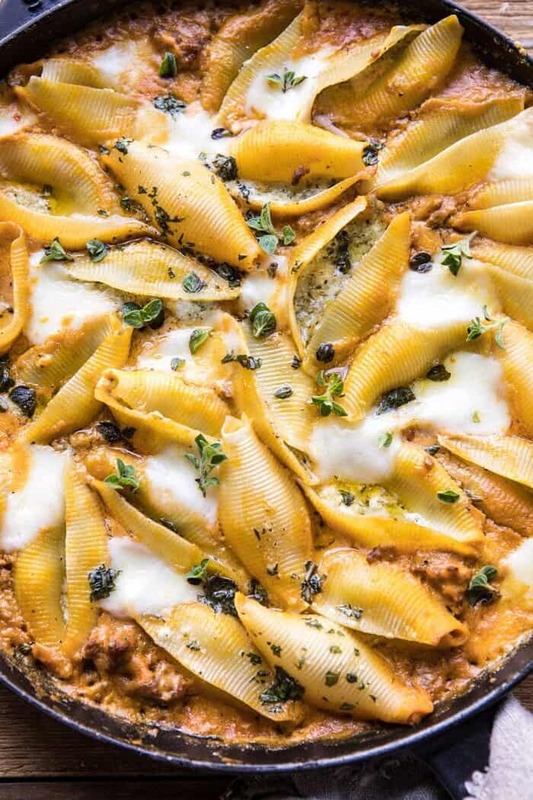 Snuggle the cheese stuffed shells right into the spicy pumpkin vodka sauce, then top with mozzarella and bake until the pasta is golden and the cheese has melted. Hello to cheesy, pumpkiny pasta perfection. This is one of the best dishes to come out of my kitchen as of late, and that’s saying A LOT since I’ve been cooking A LOT. I know it may seem a little odd to use pumpkin in such a savory way, but go with me on this one. It lends a creamy texture to the sauce while providing a hint of both sweetness and autumn flavors. Just give it try. I know you guys will all love it! 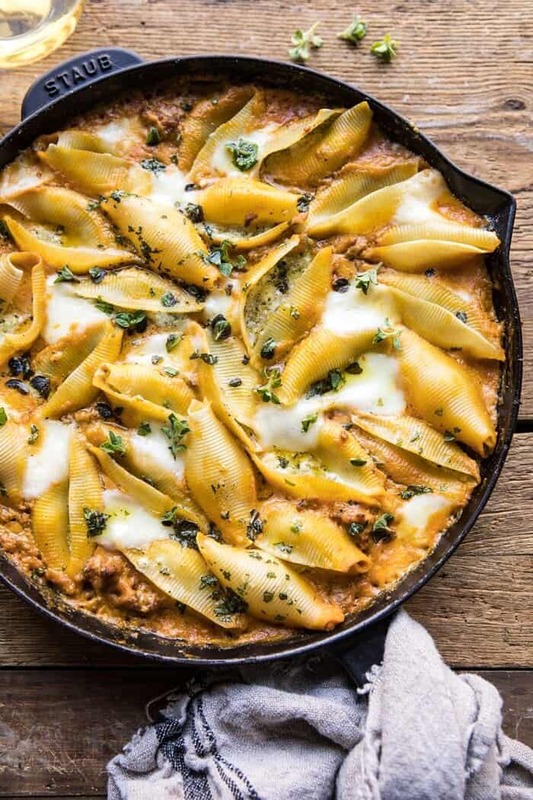 Spicy Pumpkin and Pesto Cheese Stuffed Shells from Half Baked Harvest on Vimeo. 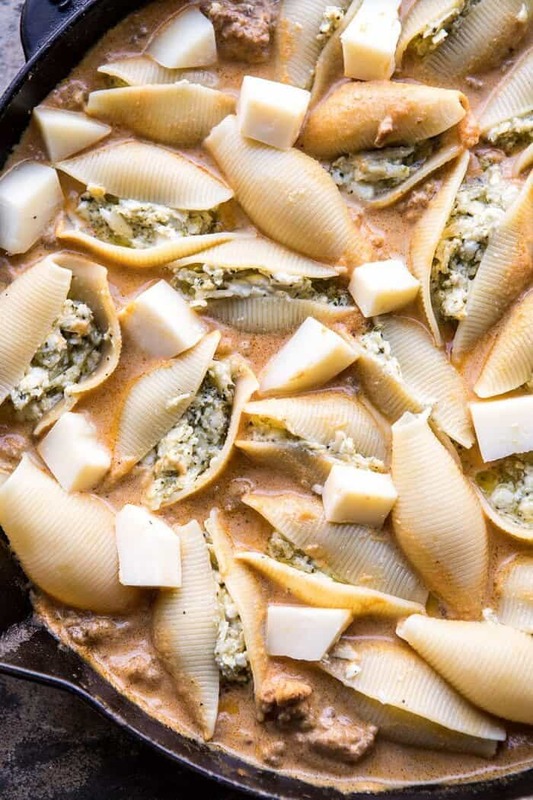 If you make this pumpkin and pesto cheese stuffed shells please be sure to leave a comment and/or give this recipe a rating! Above all, I love to hear from you guys and always do my best to respond to each and every comment. And of course, if you do make this recipe, don’t forget to also tag me on Instagram! Looking through the photos of recipes you all have made is my favorite! 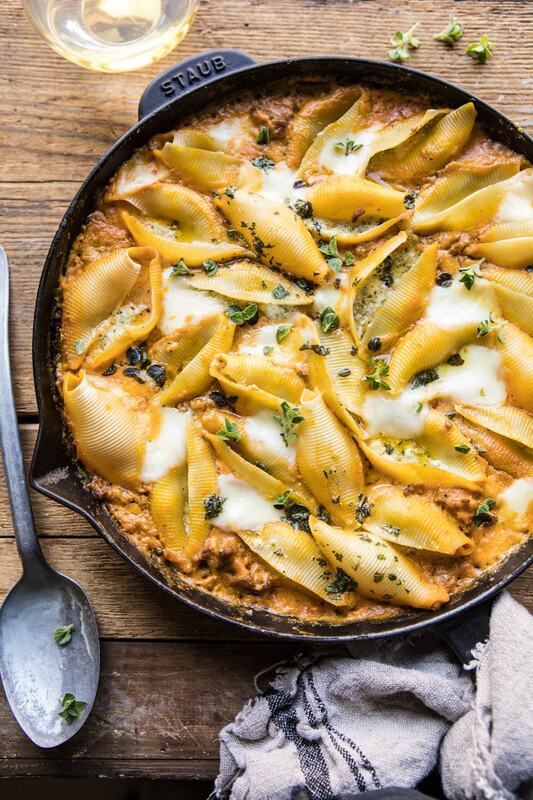 Perfect for nights when you're craving Italian, but you're also craving fall flavors. 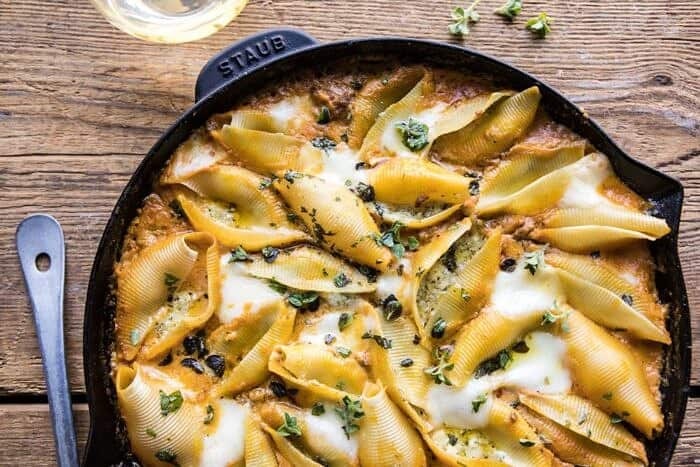 Jumbo pasta shells stuffed with a basil pesto and ricotta cheese mixture. Then baked in a spicy pumpkin vodka sauce that's creamy and so delicious! 1. Preheat the oven to 350 degrees F. Lightly grease a 9x13 inch baking dish or dish of similar size. 2. Heat the olive oil in a large pot over high heat. When the oil shimmers, add the chicken sausage and brown all over, about 5 to 8 minutes. Reduce the heat to low, add the bell pepper, pumpkin, vodka, milk, oregano, crushed red pepper flakes, and a pinch each of salt and pepper. Simmer for 15 minutes or until the sauce thickens slightly. Taste and adjust seasonings as needed. 3. Meanwhile, bring a large pot of salted water to a boil over high heat and boil the pasta until al dente according to package directions. 4. In a medium bowl, combine the ricotta, fontina, and 1/2 cup pesto. 5. To assemble, spoon 3/4 of the pumpkin sauce into the bottom of the prepared baking dish. Working with one pasta shell at a time, spoon about 1 tablespoon of the cheese mixture into each shell, placing the filled shell into the baking dish as you go. Spoon the remaining pumpkin sauce over top of the shells and then drizzle the remaining 1/4 cup pesto evenly over everything. Add the mozzarella. 6. Transfer the baking dish to the oven and bake 20-25 minutes or until the cheese has melted and is lightly browned on top. Cool 5 minutes before serving. Serve with fresh basil. Enjoy! *If you'd like to make this vegetarian, no problem, just omit the chicken sausage and use a little more crushed red pepper flakes for heat, if you'd like. *To make the pasta ahead, just do everything up until the final baking, cool, and store in the fridge until ready to serve! 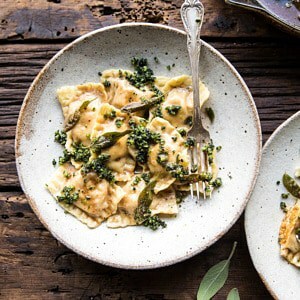 Butternut Squash Cheese Ravioli with Browned Butter Sage Pesto. Right?! I am so glad you like this recipe and hope you try it! Thank you Kelsey! If I omit the sausage, then would onion and garlic compensate for those flavors? Making for my daughter for dinner and lunch leftovers for school. It’s cross country season and she needs the carbs! Oh my days this looks delicious!! Oh gosh, I love Italian food, but this is taking it to another level. I have been daydreaming about this recipe since I have seen it in the mail a couple of hours ago. Pure italian / autumn perfection. Yum! Thank you so much Maja! Ok so I made this and omg. The fontina, ricotta and pesto filling was the real star. I was hesitant not having any tomato in the vodka sauce, however it all worked together. The pumpkin flavor is very subtle. I think next time I’ll cut out the extra mozzarella on top. It truly is an ooey gooey cheese overload, but worth the splurge. I’ll definitely utilize the shell stuffing with other sauces moving forward. Thank you so much Natalie! I am so glad you loved this recipe! Thank you so much Anna! I am so glad you loved this recipe! Looks amazing! What can I sub vodka for? Any suggestions? Would prefer no alcohol, thanks! I am all about using pumpkin for savory dishes. This is just an amazing recipe! I can’t believe it’s snowing already! I live in southern California and we don’t get anything in the way of snow. Sometimes I wish we did for the exact reasons you stated! I live in a small City and I’ve called every meat store and grocery store in town asking if they sell Ground Spicy Italian Chicken Sausage…. and nobody does. I’ve never even heard of that before. Can I simply use regular ground chicken and add some type of spice to compensate? Which spices would you suggest? This looks amazing. The sauce is soooo good. Next time I want more sauce and less cheese and definitely don’t need the mozzarella on top. I only used 4 oz on top. Thank you so much Kyann! I love stuffed shells and this recipe looks so cozy and perfect! Thank you! I hope you love this! After a helluva week…dealing with Hurricane Michael…when I saw this recipe Wednesday morning I so needed comfort! We had evacuated and tonight am back home, no damage but in serious need of comfort. It’s decadent but comfort usually is!!! I did use mild Italian sausage instead of chicken sausage. I cut the recipe in half and should’ve added some pasta water to my sauce as I thickened it a little too much. BUT, it was delish!!!! Oh I had butternut squash puree in freezer so used it instead of pumpkin. Thank you ! Hi Karen! I am so glad you are safe and doing well! I am so glad you loved this and could bring you some comfort on your first night home! Thank you! I’ve been dreaming about this for days and given the gloomy rainy UK weather on my end, think I finally have the perfect excuse to make it! I like the idea of using a ground meat to give texture to the pumpkin sauce – would using diced mushrooms instead of a veggie mince be too strong a flavour, do you think? I made this delicious dish last night!! My vodka sauce was a bit limited to fill all the shells, and yet throw some on top of the shells, so I had some leftover marinara and spooned that on top, followed by the cheese mixture, etc. It was perfect. I made a modified version of this and it’s so fabulous I’m now frantically recommending it to everyone! My version didn’t use vodka or fontina, and I replaced the mince with a veggie version. It was amazing! Thanks so much for the recipe! I love that! And am so glad you enjoyed this Amna! Thank you! Thank you Yara! I am so glad you loved this recipe! The new fall favorite dish for dinner in our house!!! That is so awesome! Thank you Kim! This looks delicious and i can‘t wait to make it! I dont want to use vodka, should I replace it with something else or just leave it out? All your recipes looks so delicious. I just made this dish last evening and all I can say is YUMMMMMMM! I have to admit I wasn’t completely sold on the ingredients, but they came together to form a creamy, just slightly spicy dish of goodness. I even hid some of the ingredients from my notoriously picky husband although it didn’t matter he loved it so much he went back for seconds and asked that I keep it in the rotation. Can’t wait to try many more of your recipes…. Thank you for sharing. I am so glad you loved this Deb! Thank you so much! Hi Debbi! I am really sorry you did not enjoy this dish! I hope you still try some others on my blog. Thank you! Thank you for all your wonderful recipies! Did you cook this whole meal in the cast-iron as a one-pot recipe? Making tonight for a dinner party! I made this last night, it is delicious. Tastes even better today–I just ate my lunch for breakfast! Loved this recipe! I doubled the sauce since my husband likes more sauce. So delicious! Thank you Marilyn! I am so glad you loved this! I made this last night on a chilly fall evening! My husband and I both loved it and I am eating leftovers for breakfast! I love the sauce- definitely different than your typical stuffed shells in a good way! Tasted like the “fall” version of Italian food! I hid the pumpkin from my husband 🙂 and he kept saying how much he loved the sauce, haha. I am so happy to hear that! Thank you so much Melisa! I hope this turns out perfectly for you! Let me know! Thank you Emma! I love getting a new post from you. Thank you so much Sue! I hope you love this! The flavors were great, but we found this to be too cheesy (mainly the ricotta filling – and I LOVE cheese, especially ricotta). I would have liked to have tasted the pumpkin sauce more and just found it kind of got lost among all the cheese. I would definitely cut back on all of the cheese next time and make a little more sauce. Very yummy though. Looks amazing! Do you recommend using fresh mozzarella? Oh wow, this recipe is out of this world. My meals this week consist of your latest butternut squash/apple soup, the smoothie bowls from HBH cookbook and this. I’m looking forward to every single one of them, thank you! For those who are wondering with what to replace the vodka, I subbed it for a mix of apple cider/lime juice and it worked great. I also used ready-to-bake cannelloni instead of shells. Thank you so much Genevieve! I am so glad you loved this recipe! Hi Tieghan, this recipe looks amazing!! I think i watched your Instagram video of this 3 times in a row! Any recommendations on where to buy ground spicy chicken sausage? I don’t eat pork so this recipe is a dream come true for me! I REALLY want to make this dish for Thanksgiving. 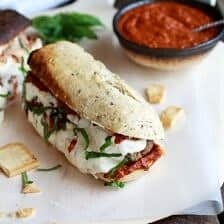 Could you suggest a brand of Spicy Italian Chicken Sausage, and do I grind it? I don’t have an abundance of choices where I live. I made this on Monday without baking it and froze it for company that was coming the following Sunday. Took it lt of the freezer for 2 hours and then baked it and it turned out beautifully. So delicious and all of my guests wanted the recipe! Thank you so much Cassie! The picture looks gorgeous and the recipe sounds like it would be delish but I have to say I found it kind of meh….not bad but I would not make it again. Loved the addition of pesto to the cheese stuffing however I did not care for the sauce at all. Family liked it well enough. Probably just a personal taste thing. LOVE your blog and have tried many of your recipes and totally enjoyed them. Hi Christine! I am so sorry this recipe didn’t work for you. I hope you love some other recipes on my blog! Loved this ! Made it last weekend and followed the instructions to a tee. It came out so well, and my boyfriend loved it too ! I had basically all the same ingredients in my fridge / pantry today, except ricotta and pesto – so I swapped the shells for rigatoni, added them to the cast iron of the sauce, and topped it with shredded fontina & torn mozzarella. SO GOOD ! Sounds amazing and I am so glad it turned out so well for you Megan! Thank you! My husband’s exact words to my son: “you’re life is about to be changed when you take that first bite.” So good! YES!! I am so glad you all loved this Sarah! Thank you so much! Just made this-so delish!!! I didn’t have enough Fontina so I did part fontina and part mossarella!! So yummy!!! I absolutely love all these recipes!! Any recommendations to make meat free? This looks too delicious to not try, but I’m a pescatarian. Help! ?